Simply cooked. High fibre and protein. Suitable for vegans.So called because they look rather like beluga caviar, these lentils have a striking appearance and absorb sauces beautifully. 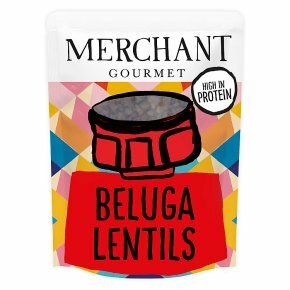 Our Beluga®Lentils have been simply cooked with onion, bay leaf, water and olive oil - they hold their shape well, so work wonderfully in soups and stews. Easy to prepare Squeeze the pouch to loosen the grains. For best results, heat through in a pan with a dash of water. Otherwise, tear a 2cm opening at the top and microwave for 45s at 900w, or simply enjoy it cold. Get creative For a colourful Mediterranean salad: mix salsa verde with some chopped cherry and sun-dried tomatoes, and stir in the Beluga®Lentils. Top with some creamy burrata and drizzle with olive oil. Lay the unopened pack on its side and heat using the guidelines below.Watts 900, Time (secs) 40.Watts 750, Time (secs) 60*.Watts 500, Time (secs) 120.Leave pouch for 30 seconds then shake well before opening away from yourself to avoid steam. Bring half a pan of water to the boil and place the pouch unopened in the boiling water. Simmer for 10 minutes, then cut open and serve.